« WOW FACTOR! Single Family Home for Sale for only $929,900! 3 Bed/2 Bath and Spacious Fenced Yard and Patio! Looking to purchase a brand new, centrally located townhouse in the heart of Richmond BC? Introducing Verona Garden townhomes in Richmond where you will find a unique development featuring only 10 homes for sale. This boutique project will feature new Richmond townhomes between 1,440 to 1,820 square feet with 3-4 bedrooms and 2.5-3.5 bathrooms. In addition, there will be a great selection of traditional 2 or 3 level townhouses PLUS a few two level duplex homes for sale. The Richmond Verona Garden project will also feature 2 car garages. The project site location is at 9211 No. 2 Road Richmond BC. All homes are protected by the 2/5/10 year New Home Warranty by Travelers and there is a private secured garage for every residence. They are pre-wired for home security systems and have heavy duty lock at main entry points. All homes have hard wired smoke detectors and pre-ducting for solar hot water. The Richmond Verona Garden townhomes have unique West Coast craftsman architecture and a wide open and well designed landscaped amenity space featuring a kids play area and bench seating. The development will also feature a private garden with concrete paving stone patio or entry stoop complete with individual hose bibs. Please register your interest on this page for more details. 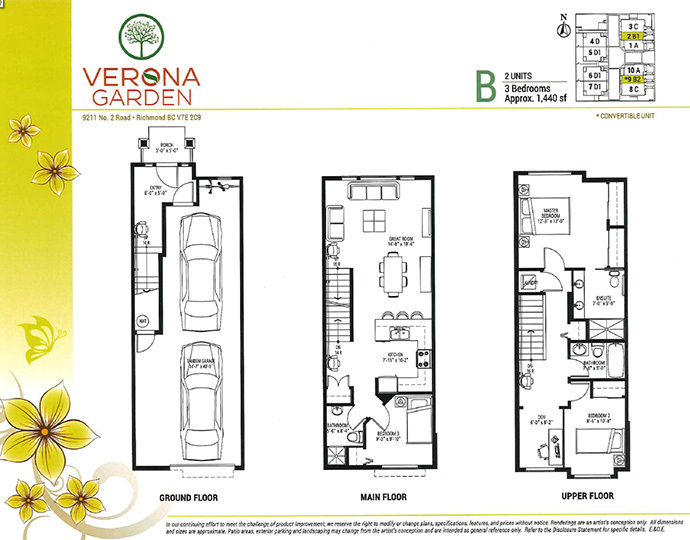 All floor plans at Verona Garden Richmond townhomes feature three or four bedrooms with two or three full bathrooms (some with powder rooms). The elegant interior finishing presents a choice between 2 contemporary interior design palettes designed by Different Design Group. There is electric baseboard heating with individual temperature control for each room in addition to low-E windows with double glazing for UV light reduction and improved energy efficiency throughout the year. Also, there is Kraus top of the line laminate floors on the main floor with abrasion class 5 rating in addition to premium ceracmic tiled floors in the entry and all bathrooms. All homes at the presale Richmond Verona Garden townhomes are pre-wired for cable TV and high speed internet. There is also pre-wiring for easy wall mounted television in the living room. As part of your new home purchase, Shaw is including 1 year free internet, phone and television package. There is also a rough-in for a built in vacuum system. The Verona Garden Richmond presales townhomes will also feature stylish wood trims including baseboards, window sills and door casings throughout in addition to two inch faux wood blinds and rain water heat recovery for energy efficiency. There is also an HRV ventilation system for bathroom exhaust and fresh air to each bedroom and living room. 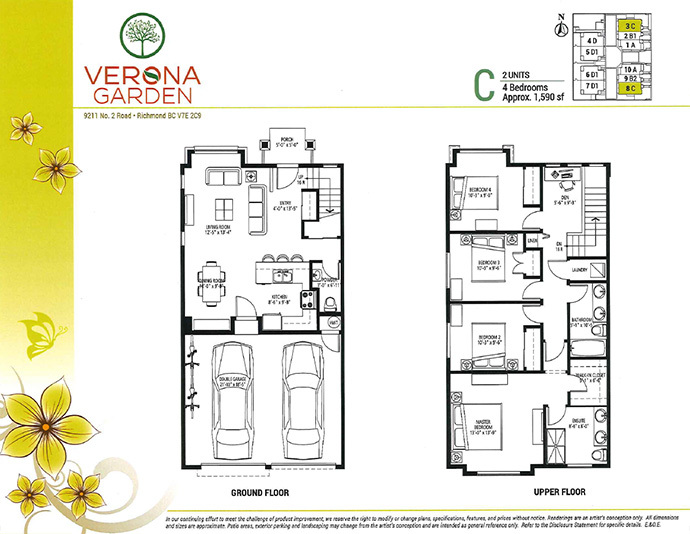 Select homes at Verona Garden townhouses in Richmond will feature split system air conditioning. Elegant bathrooms grace every home in this boutique development. They feature sleek and clean cabinetry complete with quartz counters, designer flooring and wall tile work in addition to polished Kohler fixtures including a low profile shower base. There are also dual shower heads with hand held and slide bar in master ensuites. The gourmet kitchens feature stylish wood veneer or laminate cabinets providing generous and functional storage space, durable quartz counters and dual basin stainless steel under mount sink, modern faucets with pullout sprayer and in sink garburator. The Verona Garden Richmond townhomes also feature a premium stainless steel appliance set that includes a Samsung French door fridge/freezer, Whirlpool five burner gas range with built in oven, Whirlpool dishwasher and Elica hood range. There are several spacious layouts to choose from including Floor Plan A which features 4 bedrooms and 3.5 bathrooms and 1,810 square feet over 3 levels. It’s an end unit with double car garage and priced just over $1M. Floorplan B is a 3 bedroom and 3 bathroom townhouse with 1,440 square feet over 3 levels. They are interior homes with tandem two car garages and priced in the mid $900’s. 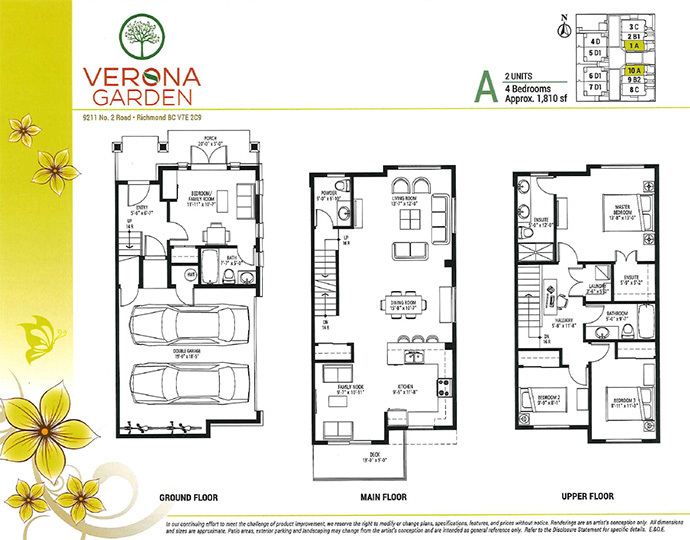 The Richmond Verona Garden duplex homes are featured in Floor Plan C which are 4 bedrooms and 2.5 bathrooms. The notable difference is that the 1,590 square feet is split over just 2 levels, making each floor plate much larger. They are end units with double car garages as well and are priced around $1,150,000. The D layouts are around 1,660 square footage and feature double car garages, 4 bedrooms and 2.5 bathrooms.